Your How To Guide should be related on your niche, and should really go into detail about what you are trying to teach your readers. They should finish reading the post feeling educated and prepared to try out what you’ve taught them. You can use a service such as Survey Monkey or twtpoll to conduct your own survey and share the responses to your readers in a compelling and entertaining way. This could be based on current industry trends, local events or trends, results of a survey, something to make your readers laugh, something to inform your readers – the possibilities are endless. Check out these 10 Free Tools for Creating an Infographic. Find someone who has no or little knowledge of your job and industry and talk to them – they will ask questions you had never thought of asking and you can turn these into articles. Challenge a popular idea or opinion in your market and offer your own, different perspective on things. 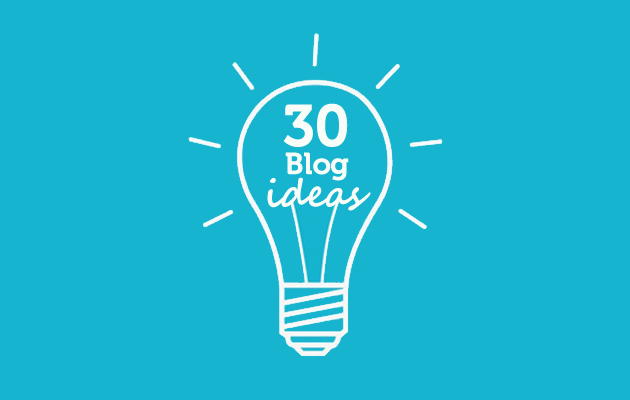 You will get people talking and your blog noticed. Offer readers an insight into your company’s daily activities by asking different members of the team to describe a day in their life at work. Read your competitors’ blogs and find out what is working for them – this will push you in the right direction. It’s great to spice up your blog with something different now and again, such as a video. The video could be funny, thought provoking, insightful – anything. You could showcase a new service or product, make a video about your office life or film something totally random! Do your own research into some current industry trends or local happenings. If you can offer your readers information that they can’t find elsewhere, they will definitely be coming back for more. Write a review on a new book, product or service in your industry. Offer your unique and honest opinion. Offer your perspective on current and relevant local or industry events, trends, updates, news stories. Your opinion may influence and educate your readers. Find a thought leader or influential figure in your market and interview them. Ask them thought provoking questions and write a compelling article about it. Competitions are a great way to get your readers interacting, sharing your blog posts and drawing attention to your company. Articles with images get 94% more views than those without. You can centre your whole blog post around photographs you have taken or pictures you have made. Ask someone outside of the company to contribute a guest blog post. This could be a leading blogger in the industry, a competitor, a customer, a local figure or anyone who has something to contribute to your blog. Inform readers what trends they should be looking out for at the moment so they don’t have to do the research themselves. Inform your readers what your company’s mission, aim, goals and future plans are. Using Google Adwords to find the search queries and phrases that people are using to reach your site, and base some posts around these as well as similar ones. Find inspiring quotes about your industry, local area, work ethic, company beliefs or anything else that could be related to your business and base posts around these. Write an article about a well-respected figure in your industry, or an article about a new up-and-coming figure. Recall interesting facts and useful information about them. You can use resources such as reddit and Quora to find out what people are talking about and what kind of questions they are asking. You can create content answering the questions that people are asking most frequently or discuss hot topics. Charity work is an excellent way to get your company noticed and build your brand’s reputation. And it makes for excellent business blog posts. Attend a local/regional/industry-themed event and report back to your readers. Recall something inspiring that you have seen, heard or done. Cheer your readers up with a heart warming story. Write some of your articles on local places, events, people, companies – this will engage the readers in your immediate area. Alternatively, you can find out on Google Analytics where most of your customers are based geographically and base articles on this location. Make some charts and feature your blog posts around them. Tell your readers about some obstacles your company has overcome and how you did it. You will inspire, inform and connect with your readers. Find out some common myths and misconceptions flying around your industry. Inform your readers of the truth. Introduce your team to your readers. You could do this via written questionnaires or interview videos, for example. It could be a collection of random and funny facts or deep and thought provoking questions. Be as creative as possible!